Gig Harbor home sales up 17% from year ago. January has not been flooded with buyers for either Gig Harbor or Key Peninsula—but the pace appears to have picked up at the end of the month. Gig Harbor posted a 40% gain in sales (31 sales) but Key Peninsula slipped by 15%(10 sales). Gig Harbor home sales were on a par with 2006. But Key Peninsula total is typical of the trend all last year with the area no longer producing its historic one-third of all sales. Local homeowners and Realtors got part of what they were hoping for–more sales, but higher prices eluded them…for the month of January at least. Newly generated (pendings)sales were on a slower pace than a year ago. 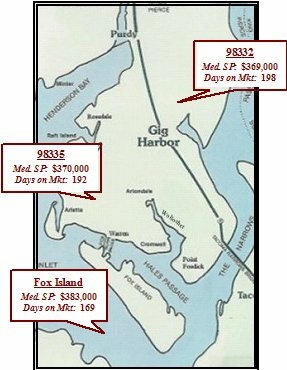 It will take another two to three months to determine a more definite pattern for Gig Harbor home sales. Median sales prices are reflective of prices last seen in 2004…in other words, nothing encouraging by way of price increases yet. The median sales price actually dropped substantially from last January. Half the months in 2010 showed improvement for Gig Harbor home sales over the year before for both sales numbers and median price. While this does not show a major uptick it does show some signs of stabilizing. Most homeowners are obviously hoping prices don’t slip any further. Inventory is continuing to fall—7% fewer homes were listed in 2010 than 2009. Once we move into the Spring season we should see inventory absorption improve too. Six months supply is considered a balanced market. Pockets of better sales can be found between $200,000 and 350,000. So what has happened to prices in your neighborhood this past year? This map will show you the median price for Gig Harbor home sales and market days in your zip code. The zip code 98332 experienced a 2.2% increase in median sales price over the year, while 98333 and 98335 dipped 15.7% and 3.3% respectively. University of Puget Sound economic professors Bruce Mann and Douglas Goodman this fall forecast the first half of 2011 will be the better part of the year for Pierce County because of the returning troops to JBFLM. That impact will diminish as the year progresses. The professors said historically recessions are caused by weak local conditions but our region’s strong economy was what caused the local delay of the national events. So our downturn started later—the end of 2008—and ended later–the summer of 2010. Their predictions look like 2011 could be another sluggish year. The professors also said at the December meeting that Pierce County could be affected with overseas devaluation. In fact the Port of Tacoma has gone through three years of sharp declines in traffic. Very little growth is expected for 2011 at the Port. They also indicated that Gig Harbor home sales could improve faster than the rest of the county. Carole Holmaas is a Broker at Windermere Real Estate, licensed since 1968. She may be reached at 253.549.6611. Her postings can be followed at http://blog.ISellGigHarbor.com.